So, my workout journey continues. I’ve experienced my various slips and backslides and general lack of motivation, but on the whole, things have gone pretty well. I have spoken previously about necessary equipment for the ritual of working out. For the most part, I would say that you can get away with very little in the way of purchases when starting down the road to a more active lifestyle. Provided you have appropriate footwear to provide support (though obviously footwear is not necessary for all forms of exercise), workout apparel that is comfortable (unless of course you belong to a nudist organization and are content with the effects of gravity upon pendulous parts), and… well, honestly that pretty much covers it. You really need nothing else. It is entirely possible to have physical activity for the purpose of health and well-being without a lot of props. That said, most people have some form of headphones with appropriate technology to provide background noise of some kind. I am lucky enough to belong to a gym that provides television screens and headphone jacks so that I need not even have my own device. I usually do, though. I’m as attached to my phone as anyone else… and so begins my tale of woe. Well, maybe not so much woe as oh my did anyone see that?!? Anyone who has jumped on the physical fitness wagon will find themselves bombarded by a variety of “must haves” and “needs” from athletic merchandizers. There are health monitors, gadgets, breathing apparatuses, self-filtering water bottles, attachments for measuring all manner of vital statistics, and of course the clothing and shoe fashions. It is a constant pull of the commercial industries to get your money, and I personally was taking a firm stance to not give into this flagrant display of capitalistic whoredom. I am made of stauncher stuff. I would not be moved (just don’t advertise the stuff on late night television because my will is weak in the wee hours). One of the silliest devices, in my opinion, was these little holster-like objects that fasten around one’s arm or other appendage and would hold sound production devices or mobile phone. They are frequently made of some neoprene like substance that reminded me, for all the world, of my SCUBA wetsuit. While I didn’t completely dismiss them out of hand, I mostly considered them a vanity for the high fashion conscious workout set. You know the type, the ones with matching outfits made of coordinated spandex and triple digit footwear. I was most decidedly not one of those people, and so, I saw no need to invest in the cute little arm/phone belt that comes in a variety of colors. In fact, I strongly suspected that a lot of people wore them for the sole purpose of showing off their biceps. This was clearly a douch-nozzle or spandex nazi object unworthy of my serious pursuit of better health. I could do very well with my handy phone holster that attaches to my waistband. I certainly did not need to spend my hard-earned wages to be fashionably equipped with my phone holder. Miscalculation number one: Phones these days, though technology is getting more miniature and compact, are heavy. They respond to gravity much like little talkative paperweights. Miscalculation number two: Not all workout pants, shorts, or leggings come equipped with drawstrings. Miscalculation number three: Cardiovascular activity generally involves some bouncing and jarring of the body and all attached items. And my fourth and final miscalculation: Pants stretch. You are probably already getting the idea. I think I heard a few snickers back there in the back. One bright and sunny day in the not very distant past, I betook myself to ye ol’ proving grounds for my daily workout. That day, I happened to be sporting one of my purchases that you may recall from an earlier article. This particular pair of leggings was of the cropped variety and was without the drawstring option. They fit well enough when I changed into them. Sadly, the sadists who designed said apparel also decided that a firm elastic waistband was also unnecessary. I believe that this garment was meant to be held up by hopes and magic. Nevertheless, I had attached my trusty holster, put in my earbuds, and mounted my favorite elliptical machine. I started at a good pace and set the timer for a nice cardio session. About halfway into my run on the elliptical, I noticed that something was happening at around waist level… or rather what should have been waist level and was now slowly creeping towards my groin area. Now, for those unfamiliar with the equipment known as an elliptical machine, I will tell you that it is a marvelous device for those of us with fragile knees. However, it is also designed to require some attention to technique and has the potential of mayhem if not attending to the poetry of motion associated with the ski-pole like handle movement and pedal like running steps. In other words, taking my hands off to adjust my waistband against the forces of gravity was some high risk behavior. Needs must when the devil drives, and so, I quickly removed one hand from the grips to jerk my waistband back up to its appropriate location and continued in my progress. I listen to books when I run typically. I must have gotten to an absolutely riveting portion of the narrative because the next sensation to draw my attention was the feeling that my backside was receiving a good deal more breeze than is normal for my appropriate clad posterior, and to my horror I found that I had, in fact, been pants’d by my phone. Yes, ladies and gentleman, the moon (well at least my chunnies) was shining for all the world to see… or at least the poor souls that occupied the elliptical and treadmill rows behind me. Oh the humanity! 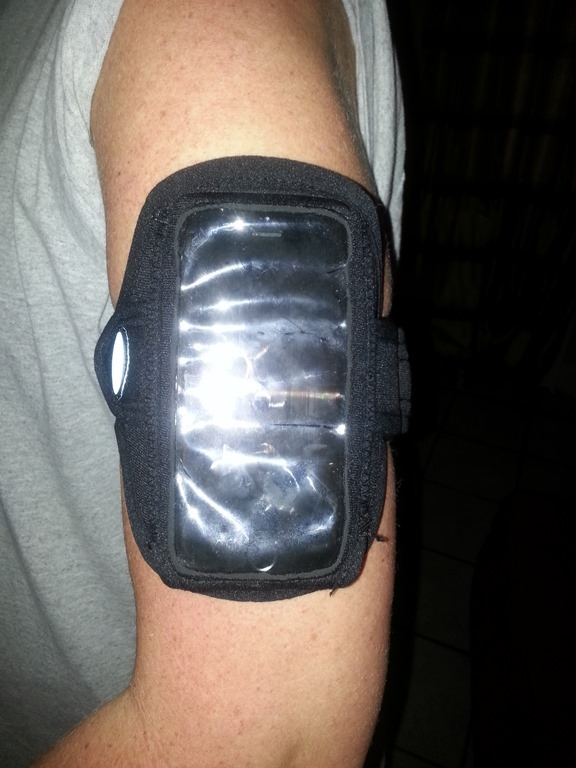 And that is how I came to own my very own arm holster… I think it shows off my bicep quite nicely, don’t you?